As we meet Maziar Bahari (Gael García Bernal), he has decided to leave his new wife in Canada and return to his homeland to tell the story of his people, who are electing their first leader after the fall of Hussain. As Bahari travels around Iraq, gaining awareness of both sides that are striving to take control of the nation, he runs into American journalist Jason Jones(who plays himself in the film), and decides to go along with his playful interview about the elections. Will Bahari be able to convince the Iraqi’s that he is innocent and they have misjudged him and his viewpoint as a journalist? Will Bahari’s captor be swayed to believe his innocence, or will he just continue to torture him? Or will Bahari’s unwillingness to appease the Iraqi’s keep him away from his wife, and his mother, forever? 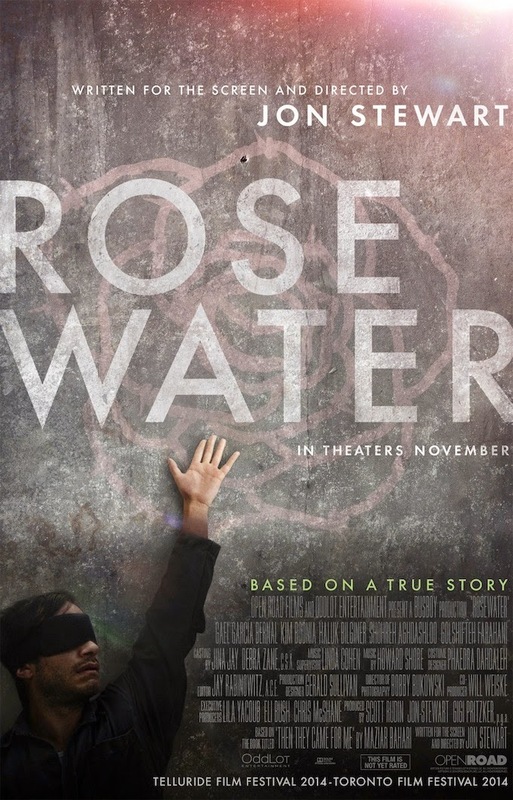 I give ROSEWATER a B-: I was very pleasantly surprised by the incredible job that Jon Stewart did with telling Maziar Bahari’s story. Ironic as it may be, that Bahari was detained and tortured due to his interview for Jon’s show, but apparently Stewart felt an incredible need to right this wrong, and to bring Bahari’s story to the masses. Gael García Bernal gave an incredible performance as Bahari, and having the genius to allow Jason Jones to play himself in the film, was magic as well. And as torture movies go, this one was relatively mild, which made it an ever better film for me, as I don’t enjoy brutality in any way, shape or form.